Good Morning! I hope your weekend was amazing and that your week will be awesome. It’s springtime folks, even if the weather hasn’t quite figured that out yet around here. My pansies that I planted inside for my Spring Living Room Tour are now outside on the porch and have been covered overnight a time or two. I’m more than ready to see Winter retreat to the North and stay put. 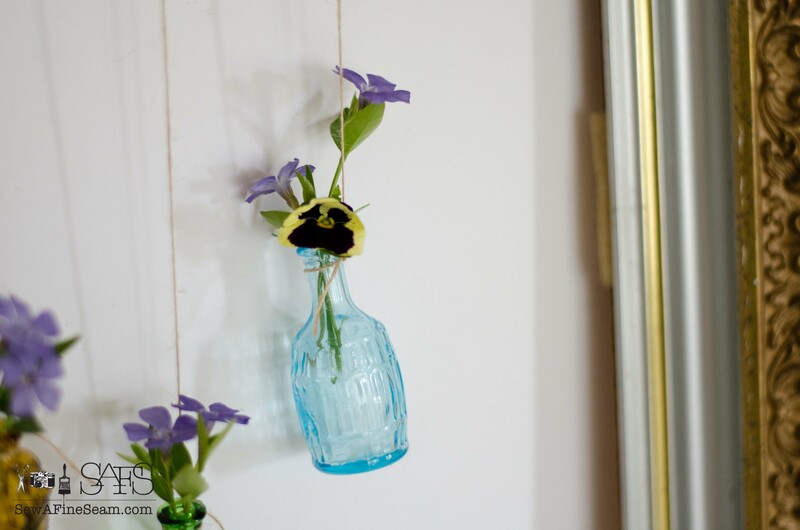 Today for A Dose of DIY I’m sharing my flower vase made of Tiny Bottles. This months category is glass bottles/vases/mason jars. I got these tiny, vintage bottles for Christmas from my Mother-in-law. I immediately tried to hide them from my girls because they have a bit of a fascination with old bottles, especially tiny bottles, and I knew they would try to take them. I informed they were ‘MINE’ and they could not have them. Then I hoarded them, knowing I would come up with something cute and fun to do with them. 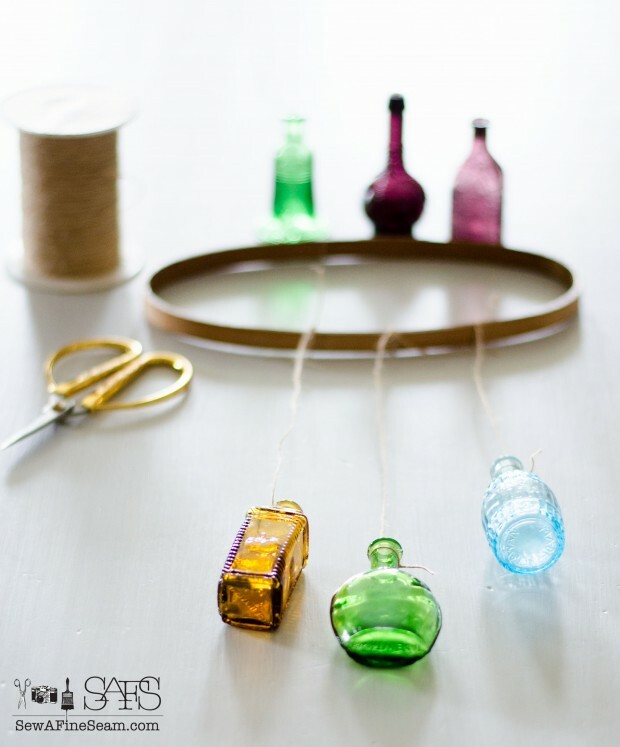 My Mom used to have some tiny bottles like this – I’m not sure what they were originally – perfume bottles? Avon? Toilette water? My Mom’s bottles were all in shades of blue – maybe all dark blue. 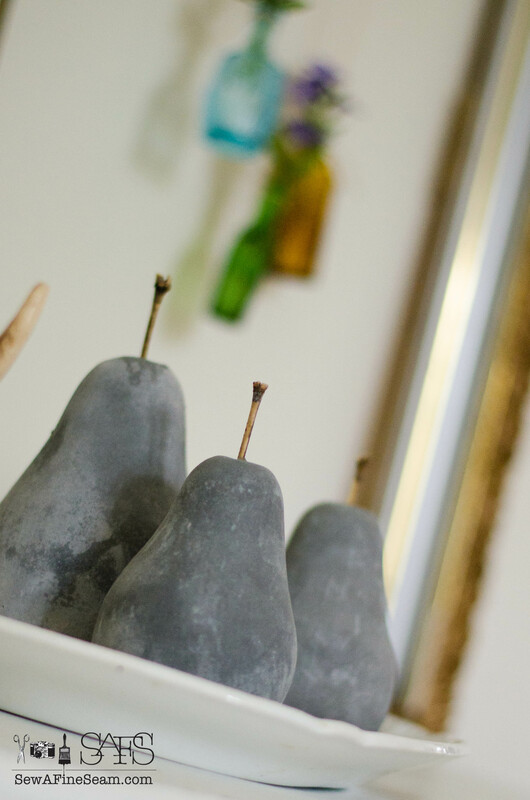 They used to sit on her window sill in her bedroom – I remember moving them to dust. The is project, like most of my projects lately, is so simple it’s almost not a real ‘project’. But I’ve found that simple is a lot of times the best, and they end up being my favs. 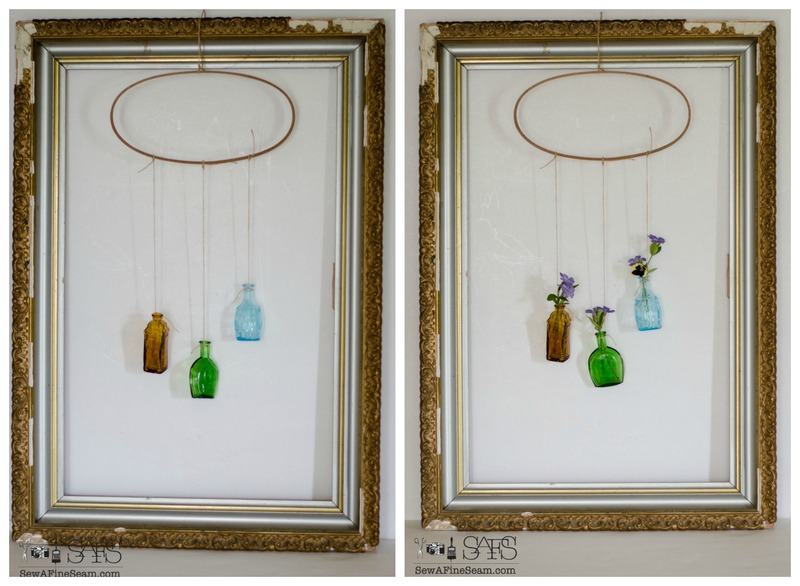 I also used part of an old, oval embroidery hoop, some thin burlap twine, and a vintage picture frame. 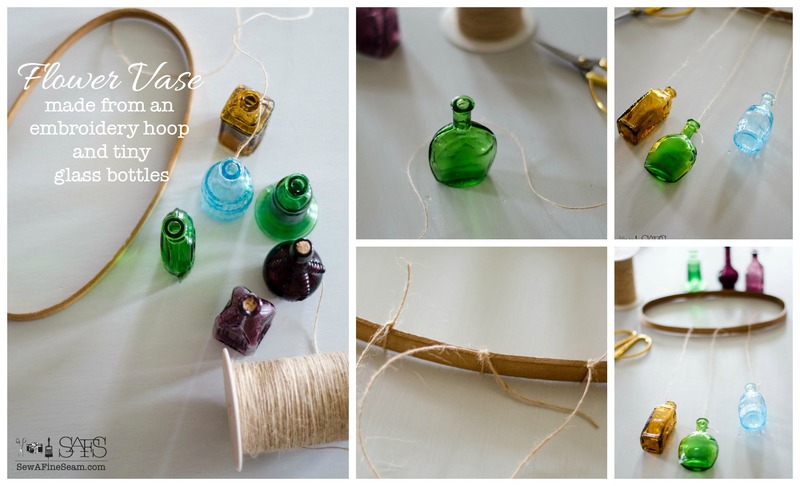 Lengths of twine were cut and tied to each of the three bottles I chose to use. 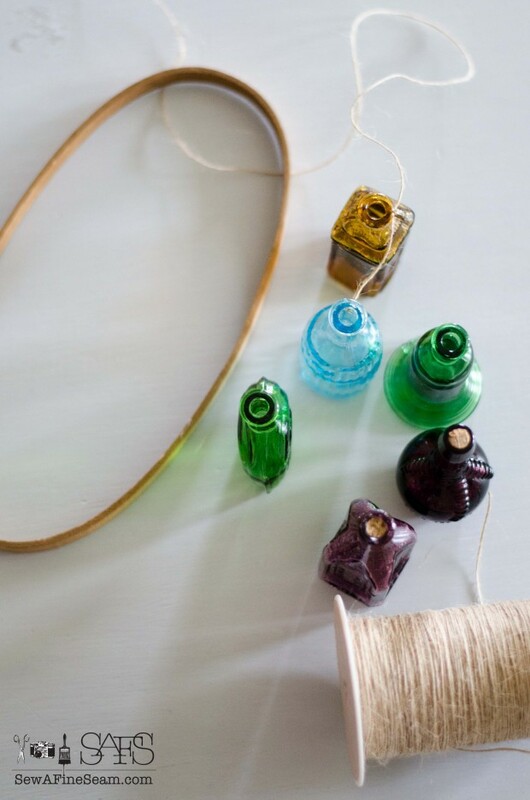 Each piece of twine was then tied to the embroidery hoop so that the bottles fell at heights that varied just a bit. 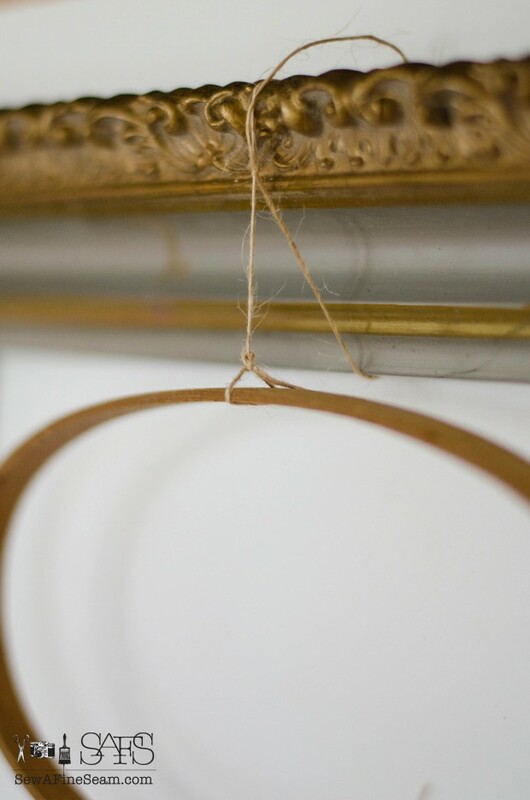 The embroidery hoop got tied to the picture frame. A few tiny flowers that have been hardy enough to survive the freezing temps that descended on us were tucked into each bottle. 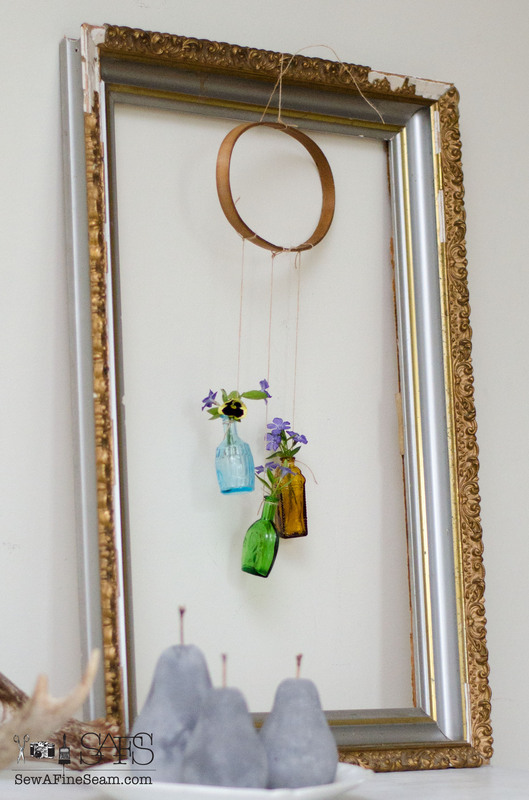 Propped against a wall the tiny, hanging bottles create a fun, whimsical bit of art. Add the flowers and you have instant springtime cheer. 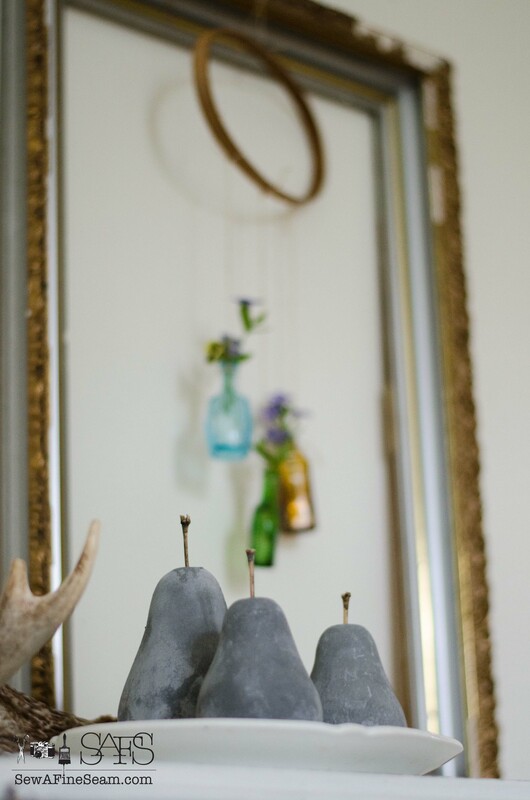 I’m loving this bit of art, in the form of a flower vase made of tiny bottles, in this vignette with my concrete pears. Another thing that makes this project great and fun is the fact that it’s all just tied together with twine. It will be simple to disassemble if/when I want to do something different with the bottles. I’m not-so-patiently counting the days till we can plant flowers for real outside and not have them freeze. My urns are looking so forlorn and lonely, especially now that the grass is green, flowering trees are in bloom, and there is a hint of green showing on the trees if you look closely. My favorite place to buy flowers opens in just a couple weeks and I can’t wait! 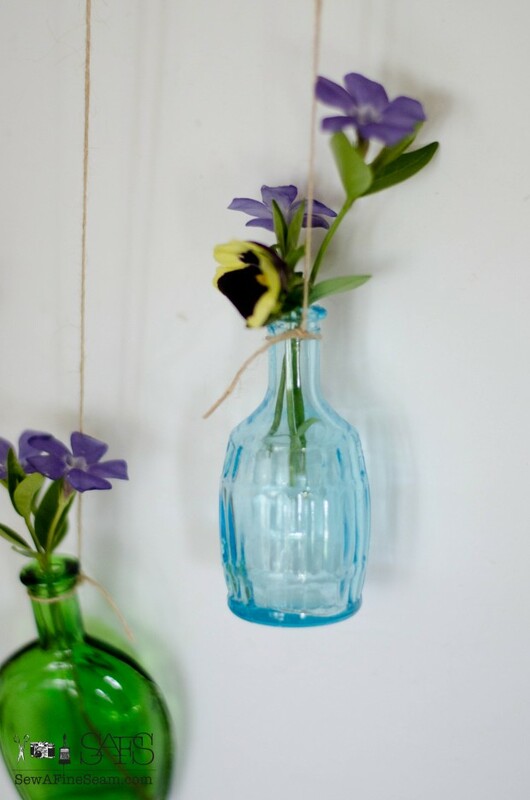 I want to have fresh blooms to cut and tuck into my glass bottles all summer long! 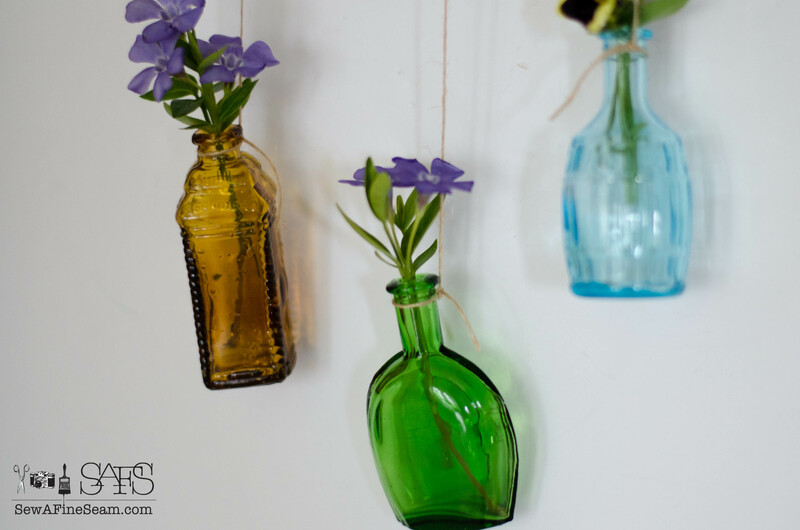 Make sure to head over to see what my friends did with bottles/vases/mason jars! They never cease to amaze me with their ideas and projects! What a cute idea Jill! 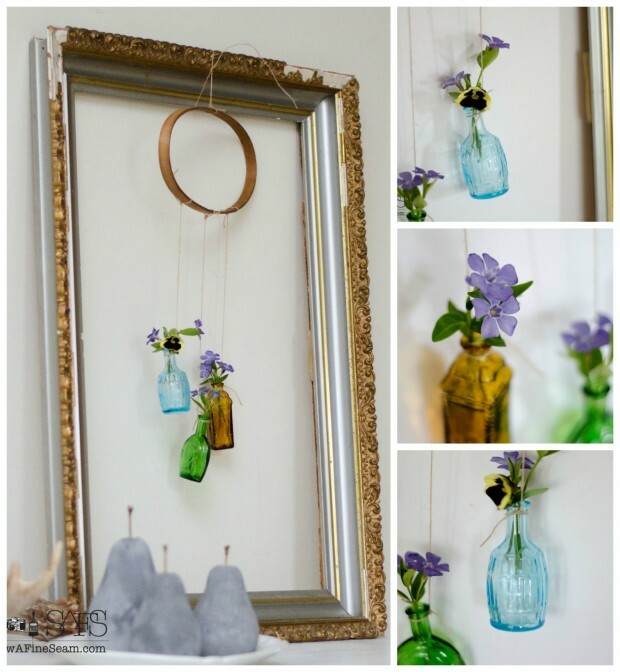 I love tiny bottles and you have created such a cute way to use them! Colleen that is EXACTLY what my girls do! They mix up ‘potions’ and have all kinds of imaginary ideas! 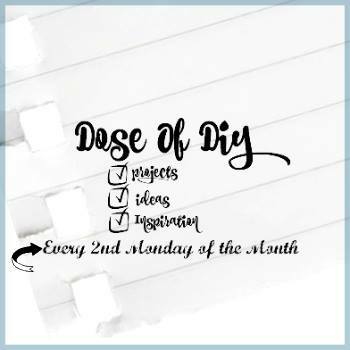 Thanks Michele – it is fun that my kids think my stuff is cool – but it’s MINE! LOL! I buy them cheap little bottles at garage sales to keep them from taking all of mine! This is such a sweet project.. Those tiny, brightly colored bottles are adorable and they look so pretty with the delicate flowers you put in them. I know what you mean about simple;sometimes it’s refreshing to be able to start and finish in a short time. I’ve been looking forward to that spring plant too! Have a wonderful day and thank you for sharing! Thanks so much Tamara – you have a wonderful day! 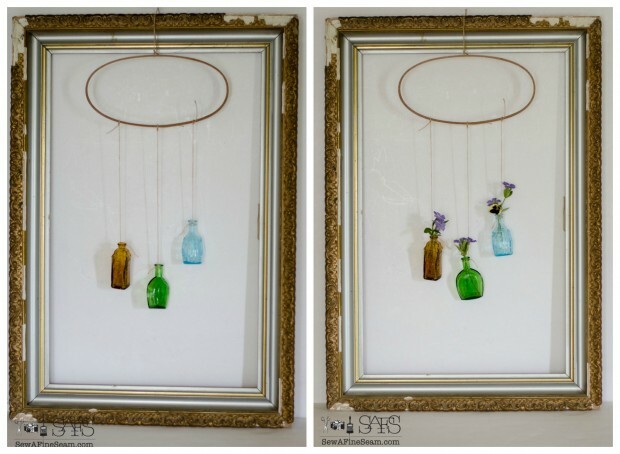 These would be really sweet hanging in a window! This is so much fun! I love glass bottles, too. 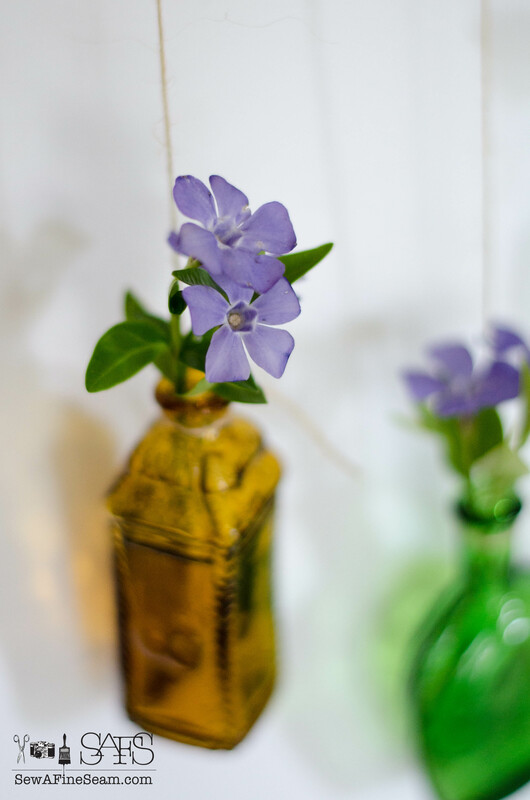 The tiny bottles with flowers tucked in are so pretty! 🙂 What is it about ‘little’ stuff that is so fun?